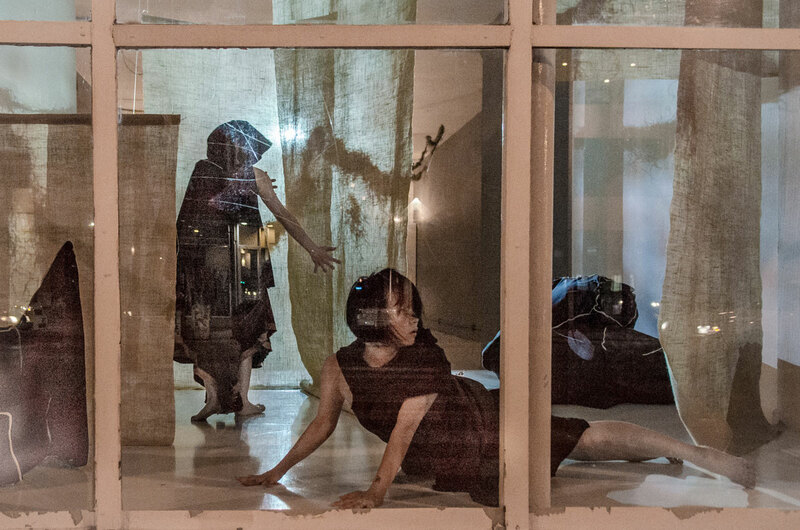 Wednesday’s heavy summer rain left the Chicago sidewalks steaming as guests filed into the new Defibrillator Gallery space in Noble Square, just a few blocks southwest of the gallery’s longtime home on Milwaukee Avenue. It was one of those rains that makes the city feel hot and gross — not the kind that refreshes and restores, or brings a cool breeze. And so, instructed to explore any and all of the Defibrillator’s spaces for the opening of the Dropshift Dance quartet “The Remains,” a trip to the gallery’s musty, dimly lit basement only raised my internal body temperature. It was just light enough to see dancers Ali Naranjo and Jill Moshman tumbling across the dank concrete floor, lit by a few fixtures and the white glow of Nadia Oussenko’s hypnotizing video projected onto one of the small room’s bleak walls — the one that led to an amber-lit, brick-lined hallway. I observed that the dancers’ feet were filthy — it’s a basement, after all. Despite the invitation to go anywhere, the rest of my group and I lacked the courage to explore down that long, narrow hallway while Naranjo and Moshman’s tumbles frequently clogged up the entrance. Per usual, these dancers care little (and don’t appear to notice) if they bump into you. Like ghosts, they go about their business dancing exactly as prescribed, whether audience members have chosen to sit or stand in their way or not. They dance into, not around us. Of primary interest to Dropshift director and “Remains” choreographer Cerniglia is an investigation into whether and how audience members react to such collisions and interactions, a concept she’s been working with since 2014, when the first episode of her four-part Imposter Series “Imposter/Malleable” premiered. This latest, “The Remains,” follows suit, with viewers’ experiences of the dance totally dependent on where they choose to be. Chen-Martinez is dressed slightly differently from the rest, often pulled away from the group as they writhe in and out of fetal position for what feels like a long time. But reflecting on the pace of the whole night, this “imposter” is dancier than the rest, with fewer long, uncomfortable stillnesses, and fewer structural impediments forcing me to change my vantage point. The open floor space and melodic score of banjo, drum kit and electric guitar set over nature sounds (by Luke Gullickson) draw the eye to the four moving bodies, rather than upward to the elegant pendant lights (Richard Norwood) and mossy garland draped from the ceiling, or toward the burlap hangings (also by Bunting) set above a raised platform at the head of the Defibrillator storefront, which serve as more projection surfaces for Oussenko’s dreamy seasonal video loops and the spot where the work ultimately ends with a gratifying lump of bodies and pillows. Individuals with imposter syndrome are incapable of recognizing their accomplishments, fearing at all times they might be “exposed” as frauds. Cerniglia’s long-running series of the same name — the Imposter Series — is suffering a bit from the same problem, unable or unwilling to move past the familiarity imposed by previous installments. Having witnessed them all, this night tugged at memories of gestures, patterns and sensory experiences already had in the past. Maybe that’s the point. There’s tremendous value in choreographers setting up shop with a particular idea for months, years, decades even. For me, “The Remains” revels in what has already occurred instead of plunging unabashedly forward into new territory. Of the four works in the series, “The Remains” offers the most satisfying passages of movement, but the least visible trajectory from beginning to end. Then again, Cerniglia’s work requires patience and curiosity, and on this particular night I felt neither, bringing little to the table to cull through the work in a way that felt new or meaningful … and that’s on me.